Reliable water testing shows you what needs to be done. Balanced Pool Water Chemistry Is A Must. How to properly and reliably test pool water? Proper pool water management starts with the analysis of the pool water. Tests such as pH and chlorine need to be performed by the pool owner, on a frequent or daily basis, depending upon the usage conditions. The Chlorine test should be performed by a method that tests for Free Chlorine, as it is the most important form. Tests such as chlorine stabilizer, total alkalinity and calcium hardness are performed occasionally during the season and can be performed by a pool owner or dealer. Tests for heavy metals such as iron, manganese or copper should be performed at the beginning of the season or at the first indications of pool water discoloration or a pool surface staining problem. These pool water tests are usually performed by local dealers. Tests for nitrates, phosphates or Total Dissolved Solids (TDS) are performed by some dealers, on a occasional basis, if a more obvious explanation is lacking. Maintaining or balancing proper pool water chemistry or pool water balancing is important to help to minimize problems, assure optimum water quality and to maximize the ownership experience. Water testing has never been simpler: the new ColorQ digital, water analyzers eliminate all color-matching and guesswork. If problems arise, refer to the Pool Problems Page, as a source of problem-solving information, broken down into various categories. Scroll down the page and click on the linked keywords, catch phrases or images, in the archived answers below, to access additional information, on that topic or product. ► This Is What Very High Chlorine Levels Do To Test Results? We just recently opened our pool and began testing chlorine levels with our ColorQ test kit purchased a few years ago, from your company. I have since noticed that the test drops DPD-1A and DPD-1B, purchased this year, appear to be defective. When testing the water the DPD 1-B drops turn a red color for only a short moment (3 to 4 sec) then they go nearly clear indicating a need to add chlorine. I know I have a more than adequate level of chlorinator in the water from a test strip test. I do not see any issues with the pH drops, the total alkalinity drops and calcium drops however I have nothing to compare them against as I already disposed of our remaining test drops from last year. Could these drops be bad also? Please let me know what the problem might be and when you can rectify it. It would appear that the free chlorine level is so high, that it is destroying the test chemicals. Take a sample of pool water and mix it with 2 parts of tap water. Test the mixture. If you get a test reading, multiply it by 3. It won't necessarily be an accurate answer, but could confirm the presence of a very high level. Most testers only read chlorine, to 10 PPM. You don't need to add more chlorine, as you probably have far too much. The reagents are not defective. It is a very high level of chlorine, probably over 20 PPM, that is caused the quick fading. Let me know what happens. Thanks so much for the quick reply! You called it. That was it. 2 parts tap water to one part pool water and I’m at 7.51 free and 7.99 to on the LaMotte tester. Good balance, if it just was not so high. I guess it shows about 25 PPM of chlorine, after multiplying by 3, which means that I was too heavy handed. I guess the HOT 95 degree sun here in Michigan will burn it off in no time at all. Thanks again for the response and continued great knowledge and service. ► Testing Water With A Salt Chlorine Generator In Use? I just equipped my inground pool with a salt chlorine generator and want to make sure that I continue to get the right testing information. I use a #2056 ColorQ PRO 7 photometer kit and it makes provided reliable results and I like its ease of use. Can I continue to use this tester or do I need something else? The salt chlorine generator has salt level indicator lights. Can I benefit from a separate salt tester? I am really looking forward to using the salt chlorine generator and now longer having to deal with cyanuric acid buildups and water replacements. I appreciate any information, that you can provide. All ColorQ Water Analyzers are ideally suited, for use with pools equipped with salt chlorine generators. All of the tests, performed on traditionally sanitized chlorine pools, should continued to be run. As always, Free and Total Chlorine and pH should be tested daily or at least several times weekly, depending on the actual circumstances. Salt levels need to be maintained at the level, suggested by the equipment's manufacturer. A proper salt level helps assure proper performance and extends the life of the salt cell. A digital salt tester is the best and easiest way to monitor the salt level, over time. We offer a choice several models of digital electronic salt testers. I hope that this information will be helpful. ► Test Strip Reader Or A Digital ColorQ? Hi Alan. You have an excellent website and I appreciate the willingness to answer questions. So here goes. I am a new pool owner. I have been testing with test strips that require me to evaluate the colors. I have strips that measure Chlorine, Bromine, pH, Alkalinity and Hardness. I have trusted the results. Lately with all of the reading I have done I have become very fearful of my pH being out of range and thus I purchased an automatic test strip reader. This reader has strips that measure Chlorine/Bromine as well as pH and Alkalinity. The strips are dipped and placed face down on the reader and the reader determines the values. The problem is that I can not get the old method and this new reader to agree ever. I have no idea what my pH level is because one reads 7.2 and the standard strips measure 6.0. The strips and the strip reader are made by the same company, so there is no compatibility issue. I realize that I could be judging the colors incorrectly, but I don't think that I am. Which one should I trust? I have checked your website Test Equipment Store, for the ColorQ testers, and I am wondering, if I should be returning my automatic reader and purchasing one of these. My reader cost about $70 but I don't mind spending more if it will read more accurately. I also found that there seems many types of ColorQ models. Which one I should be considering. Thanks. Test strips are reasonably accurate, but were never intended or expected to be a precision test method. Some people have difficulty picking up on subtle color differences. Using a test strip reader sounds like a good idea and for some people and it might be, if you have color vision impairment. However, from a chemist's point of view, it is adding another layer of complexity and cannot add to the accuracy of the test results. Your own experience bears this out. I have no way of telling you which answers might be more reliable and you should not have to guess. If you can return the tester, I certainly would do so. The ColorQ family of digital water analyzers are a much better choice. There is no color-matching or guesswork involved. You get a digital readout, with the answers for as many different test factors, as that model can perform: The 12 models of ColorQ testers measure from 4 to 11 different test factors and there will be one of more that suit your needs. The ColorQ testers are simple-to-use and, yet, use the same technology as more sophisticated pool water testing labs. I think it sets the standard, for the industry, with a selection of models that will suit every pool or spa owner. For your purposes the #2056 ColorQ PRO 7 or the #2072 ColorQ PRO 6 would be the best choice. I hope that this is helpful. I have a ColorQ PRO 7 Digital Tester, which I purchases last year, on your website. I really love this tester. It completely eliminates the guesswork, in trying to match colors. I was never good at that and with the ColorQ, I don't Have to do any color-matching. What is the best way to order replacements? Thank you. I am glad to hear that the ColorQ PRO 7 is serving you well. All of the individual items for the ColorQ PRO 7 and all other ColorQ models, as well, can be found on this page: Test Kit Replacements. In addition, there is a money-saving refill pack, that contains all replacement items and some free test tubes. There is one available for the ColorQ PRO 7 and several other models, as well. I hope this information will help keep you testing and enjoying the season. ► Testing Errors Due To Very High Chlorine Levels? Hi, was wondering there is any evidence that when testing pool water for chlorine, CYN, TA, TH etc, a high chlorine level, in the test water, will cause these measurements to be incorrect? Regards. With the single exception of the cyanuric acid tests, all of the colorimetric tests can be adversely affected by high levels of chlorine or bromine. While some of these solutions, such as pH and TA may contain chlorine neutralizing compounds, high chlorine or bromine levels can overwhelm them and allow some of the testing chemicals to be degraded. Cyanuric acid is done by a turbimetric method and should be unaffected. All of the other tests use organic chemicals, which can be destroyed, by high chlorine levels. Even the chemicals used to measure chlorine can be degraded, by very high levels. You can lower the chlorine level in the test sample by adding a drop or two of a chlorine neutralizing test solution. Not suitable for the chlorine test, for obvious reasons. I hope that this information will prove helpful. What is the accuracy of swimming pool test strips? I can't seem to get any of the manufacturers to send me lab data on the accuracy of the strips. Good question! Test strips are not a precision laboratory means to test pool water. They are intended to provide satisfactory and reasonably accurate test results, with convenience and ease of use. If the test strip reads a pH of 7.4, that should indicate that the pH is 7.3-7.5. For swimming pool or spa use, this is not a problem and is more than adequate. If the Free Chlorine reads 1.0, that should indicate a concentration close to that value. Does it matter if the true reading is 0.9 PPM or 1.1 PPM? No! It does matter, if the reading is 0.2 or 2.2 PPM. The testing of swimming pool water does not require the precision and accuracy that one would expect of a blood or urine test. Do test strips provide reasonably accurate and useful results? Yes! How you take the water sample or store the test strips can affect the test results. I have a feeling that the manufacturers were reluctant to provide the information because they have no control over how the test is performed, the water is sampled, the directions are followed or how the test strips were stored. However, not all brands are the same in terms of their formulation, manufacture or test chemistry. 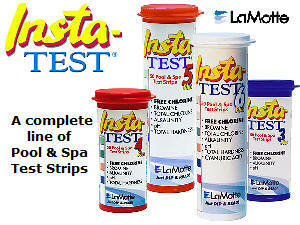 My own personal experience with the LaMotte Insta-Test product is very favorable. I hope that I have been helpful. I just put up a vinyl pool that is 15 ft round x 3 ft high. Since I just filled it I put a packet of Vinyl pool shock (1 lb) with the pool filter running. After a day I did the water test and the OTO level on the tester still shows above 3 ppm and the pH shows above 7.8. I know I can add pH minus to reduce this, but how do I lower the latter to 3 ppm? Thanks. You may not have to anything about the chlorine reading. While OTO is popular, it is far from the most meaningful test. I suggest that you try using a ColorQ all-digital water analyzer, as they provide the right kind of information - easily and reliably. There are 12 models and one or more will suit your needs. Occasionally, to better assure proper overall pool water chemistry, visit a pool store that has a very reliable, professional lab such as a WaterLink SpinTouch Lab, rather than a less accurate test kit or strip reader. The recommended level for Free Chlorine is 1-3 PPM and the Total Chlorine level should not be more than 1 PPM higher. Using the pool with very high chlorine levels can be irritating. The chlorine level will drop over time as the pool shock reacts with algae and debris. I hope that this information will prove helpful. ► Professional Pool Water Testing? I OWN A RENTAL STORE AND JUST GOT STARTED SELLING POOLS, CHEMICALS AND SUPPLIES THIS SPRING. IT HAS BEEN GOING GREAT EXCEPT THAT I AM USING LIQUID REAGENTS TO TEST EVERYONE'S WATER. I DON'T HAVE THE SOPHISTICATED SYSTEM THAT THE ONES IN THE BIG CITY OF KANSAS CITY HAS. MY STORE IS 50 MILES FROM THE CITY AND I'M TRYING TO GET ALL POOL CUSTOMERS, HERE IN RICHMOND AND LOCALLY, TO COME AND LET ME TEST THEIR WATER. SO MY QUESTION IS ARE THE ONES UP IN THE CITY USING A WATER TEST SYSTEM THAT YOU POUR THE POOR WATER IN IT AND YOU GET A PRINTED READ OUT AND WHAT IS IT CALLED? THANK YOU AND LOOK FORWARD TO HEARING FROM YOU. It could be as simple as injecting a sample of water into a disk, that contains the testing chemicals! They are probably using a WaterLink SpinTouch Lab. It is the ultimate pool and spa test. Simply add a single, 3-ml sample of water to a Spin Disk, insert the disk in the tester and press a button. In just a minute, you will have the tests results, for up to 10 different testing parameters, and be able to print a complete report. And did I mention that you don't have to be a chemist? Confidence in the testing procedure is a two-way street between the dealer and the consumer. In addition, The LaMotte Co. has a locator, on their website, that will direct pool and spa owners to your location. I hope that you'll find a product that suits the needs of your business and your customers. Good luck. I have recently opened a Pool and Spa Chemical Supply Shop near Charlotte, NC and require information and relative costs etc to test our customer's pool water samples as quickly and efficiently as possible. I hope you will be able to assist. Regards. There are several factors for you to consider as a pool professional dealer. Speed: during peak season, you want to move things along as much as possible. Thoroughness and Accuracy: you need to do all the important tests, when required, with suitable accuracy, from even a relatively new operator. Cost: speed and cost can go hand in hand, to a degree. Simplicity: keeping it uncomplicated by using dosed testing chemicals, disposable components and a minimum items that require rinsing and cleaning for each test. Professionalism: you need to use equipment that will instill confidence in the consumer as well as the water tester. I suggest that you go our Test Equipment Store There you will find information on an extensive line of professional pool water testing equipment, as well as costs and availability. Automated is easily achieved - automatic is more difficult. Your choice will be influenced by budget and needs. You should be able to pick a water testing setup that meets your requirements. 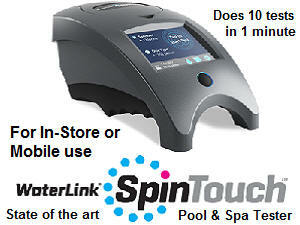 So far as technology and speed are concerned, the new WaterLink SpinTouch Lab is as good as it gets. Ten different pool water tests and a printout, in only one minute. Good luck on the venture. I just had to write to say I LOVE your website. It's keeping me sane in my world of three competing pool dealers, with conflicting advice on pool chemistry. Now, if only their measurements would stop conflicting, I'd be home free. Being better informed helps avoid falling victim to a dealer with the wrong information or test results. Water chemistry is where it starts! Some new testers are just available. It is the LaMotte ColorQ Water Analyzer. There are 12 different models to choose from: one should be just what you need! It includes everything that is needed. All are simple to use, hand-held, all-digital, accurate and reliable, do all of the important tests, require no color matching or look up charts and are reasonably priced. In the long run, being better informed will save you money, time and should minimize problems. I'm glad to hear that this website has been helpful, as that is our goal. ► Trouble Dealing With The Colors? My son has always tested our pool water, as I have trouble trying to distinguish some of the colors. Is there a simple way to test pool water without having to check colors? Something affordably priced would be perfect. This fall, he will be off to college and I'll be on my own. Thanks for the help that your website provides. Pool dealers have been using colorimeters to electronically test water for years. The problem is that this type of equipment is relatively expensive and is really only intended for high volume, in-store testing of pool or spa owner's water. A new, reasonably priced product is available that utilizes a hand-held colorimeter. The ColorQ PRO 7 Water Analyzer measures Free and Total Chlorine, Bromine, pH and Alkalinity, Calcium Hardness and Cyanuric Acid. It is done with a colorimeter and all you have to do is read the answers on the large, LCD display. No colors to distinguish and no more guesswork. Perfect for pool owners, pool servicemen, especially, those with color vision impairments. Other models do additional tests, such as iron, copper, biguanide and biguanide shock. The proper testing of pool water enhances the ownership experience, by helping to assure better water quality and sanitation. I hope that I have been helpful and that this is a solution. ► TDS And Salt Relationship? We have a 44241 gallon salt water pool. We own a meter that tells us our salt and total TDS reading.. we have heard that our TDS reading may be a bit higher since it is salt water... did not know if you could give us an equation that would give us a TDS only reading. We have been told that we do not want that number to be above 1500. Some of our swimmers are complaining of rashes and we just want to make sure everything is ok. We do not want to have to drain the pool if it could be avoided. Thank you. First, you have to understand what TDS Testing comprises. It is the total of all the salt added to the pool, plus all the chemicals used to balance the pool chemistry and all of the mineral that naturally occur in your source water. The recommended levels of salt will vary from salt chlorinator manufacturer to manufacturer and even by model. Assuming that the salt level is 3000 PPM and the TDS is 4500 PPM, that means that the TDS would have been around 1500 PPM, even if no salt was added. These values are but a fraction of the levels in ocean water, which can be 15 timers higher than the salt level in your pool. 1500 PPM of non-salt TDS is high and is not ideal, as it can interfere with clarity, water quality and sanitizer effectiveness. You need to test the tap water. In places, like Arizona, it can be 1000 PPM or more, right out of the faucet. In that case, water replacement is not a realistic option. If the TDS is low, partial replacement is an option. Your question refers to bathers getting rashes. The cause of rashes is more likely to be inadequate sanitation, too high a level of combined chlorine, too high a free chlorine level and pH readings that are too far removed from the ideal of 7.2-7.8, as opposed to high TDS. Salt chlorine generators tend to cause the pH to rise, unless regular additions of acid are made. This can lead to a loss of sanitizer effectiveness and increase the possibility of irritation. That is where I would look. See if there is a correlation, between the pH and chlorine levels and the complaints. I hope that this information will be helpful. ► How Often To Test Pool Water? I try and test the pH and chlorine at least every other day. Is that often enough? How often should I test for total alkalinity and chlorine stabilizer. Thank you. Testing the pH and chlorine every other day is quite reasonable. In addition, I would test at the first sign of a change in water quality or during periods of high bather demand. Test more often, if problems crop up or bather usage is very high. The more important chlorine test is the Free Chlorine Test: free chlorine is the active germicidal form. The total alkalinity should be tested at the start of the season, whenever there are fluctuations in the pH and monthly during the season. The chlorine stabilizer should be tested at the start of the season. Unless the stabilizer level is approaching too high a value, once or twice a season is sufficient. The balancing of the pool water chemistry will, in the long run, solve or avoid many problems. If you're looking for an easy-to-use tester, that eliminates all the color-matching and guesswork, a ColorQ all-digital water analyzer will be an excellent choice. I hope that I have been of assistance. Enjoy the season. ► Bleaching Effect On Test Strips? I recently had the strong chlorine odor problem followed by a cool weather streak which lead me to leave me pool cover and neglect my normal maintenance for about two weeks. When I opened the cover, I found the pool to be cloudy and green. I used algaecide and shock to resolve this and put chlorine tabs in the dispenser. It took three days of shocking to clear up the water. The chlorine reading is still so low it is not registering on the test strip. I read that if there is too much chlorine in the water it will have a bleaching effect on the test strip, so I took a sample of the water and diluted it to see if I could obtain a reading. The reading was still low. Should I shock the pool again? Test strips, such as the LaMotte Insta Test Strips are one of the best ways to measure high levels of chlorine. The bleaching effect, that you are mentioning, is more likely to happen with OTO or DPD testers. I suggest that you add the liquid chlorine or quick dissolving shock, about a pound/gallon per 5,000 gallons, until the free chlorine level is over 5 PPM. Don't drag it out! The longer it takes, the more product will be required. Keep it there until the problem is under control. You have green water because the sanitizer level was inadequate and algae took hold. Check the overall water chemistry as well. Make sure that you are testing for FREE CHLORINE. I hope that I have been helpful. If so, please tell your friends about the website. ► High Chlorine Levels "Bleaching" Test Chemicals? Sorry to bother you again Alan but just a quick email to see if you can give me some info. I did a pool course a while back and I was reading through the notes and it said if pool chlorine reaches over 10ppm, 'bleach out' could occur. It did not however explain what this meant, nor could I find it on the net. Could you help with this. Many thanks, as always. When the chlorine level get too high, it can destroy the testing chemicals and provide a false result. If you suspect that the chlorine is over 10 PPM, try this. Mix 1 part of pool water with 2 parts of bottled drinking water. Test immediately! Multiply by 3, to get a reasonable approximation of the true reading. This technique is not valid, with the other tests. For the other tests you would have to use distilled water. pH cannot be done, using anything but the actual water sample, but a few drops of chlorine neutralizer can be added, before testing. I hope this clears up the problem. ► How Long Do Test Strips Last? I have some test strips from last year. Are they still good? ► Saturation Or Langelier Index? Saturation index for pools? Do you have any, where you can put the pool test results and gives you the answer? Could you let me know? That would be great. Thanks. There is a page on the website devoted to the calculation of the Langelier or Saturation Index, as well as information on the Ryznar Stability Index. I hope that the information will prove useful. Hi Alan. We recently bought a house with an inground gunite pool. We are having a problem with what I believe is mustard algae. After reading the questions on your website I am confused about free chlorine tests. We bought a test kit to test chlorine levels, but I do not know how to test for free chlorine. Please help! I suspect that you are using a test kit with a color block for pH and Chlorine. This would be an OTO test kit and it does not measure for Free Chlorine: the active germicidal form of chlorine. For pool owners that prefer to avoiding having to differentiate slight color differences, the new ColorQ Water Analyzers are just what you need. With a variety of models, there's one or more that will best suit your needs. Easy to use, with diagrammatic instructions. This is a step above most testers. I hope that I have been helpful. Enjoy the pool. ► Time To Take Charge? I have a new pool that was completed six weeks ago. The pool is a 16,000 gallon in-ground gunite pool with an aggregate finish and a salt system in south Florida. I had hired a pool professional to start up my pool and maintain it, since I was told that optimizing a new pool would be difficult. However, after five weeks I noticed that the pool did not register any chlorine level and the pH was always above 8.2. My pool professional indicated that my test strips were not accurate and that the pool was fine. I then proceeded to have a sample analyzed by my local pool supply store and they concurred with my readings. At the time of testing, the chlorine and free chlorine level was 0 ppm, chlorine stabilizer was 0 ppm, total alkalinity was 200, pH was 8.2, TDS was 0 and calcium hardness at 40. They indicated that I needed to get the pH down or risk scaling. Following their instructions, I added chlorine stabilizer, put my chlorine generator on boost mode for 24 hours and have added several gallons of muriatic acid (and fired my pool professional). After 1 week, I have chorine levels around 3 ppm, pH has been ranging between 7.4 and 8.0, total alkalinity at 80. In order to get the pH level down, I have been adding about a gallon of acid every other day (not sure if adding this level of acid is recommended or not). My problem is my pool finish. The bottom looks good; however, the walls seem to still have a lot of “paste” that has not wore off from daily brushing to expose the aggregate. Additionally, when I run my hand along the walls they seem slimy. The water has always appeared to be clear. Any insights on what’s happening? Your "pool professional" was not very professional. and I have some doubts about the pool dealer. New gunite pools tend to have pH readings on the high side and the use of a salt chlorine generator only adds to the problem. Once the walls cure and the chemistry is optimized, it will level off. Your "pro" did not add stabilizer and that is why your reading is zero. Or is it? The pool store has your TDS at zero and that is impossible. It should be around 3000 PPM, in your case. A calcium hardness of 40 PPM is doubtful, as it is higher right out of your tap. The slimy feeling on the walls is an algal or bacterial slime and is the result of inadequate sanitation and/or circulation. It is time to take charge here and do some testing of your own! I suggest using a ColorQ all-digital water analyzer. They are easy to use and provide the right kind of information, for all of the common pool water test factors. There are some "questionable" strips out there, just like there are some questionable " professionals." You need to test for free chlorine and maintain a level of 1-3 PPM. With slime on the walls, boost the level to 5-10 PPM, in order to help destroy these deposits. Your pH should be maintained at 7.2-7.8 and adding acid is how it should be done. A low hardness can contribute to etching, which in turn will drive the pH up. Get the hardness to about 200 PPM. Because you have a salt chlorine generator, I would concentrate on the pH and not worry about the total alkalinity, unless the hardness is over 400 PPM. Make sure the salt level conforms to the manufacturer's recommendations. To help improve circulation you might consider adding The Pool Circulator: circulation boosting device Get the chemistry right and don't rely completely on the action of others. Be better informed. Things will improve. ► What Levels Of Metals Are A Problem? We are just finishing up a pool installation and they are getting ready to do the plaster coat. What are the acceptable levels or thresholds for copper, iron and any other materials content in our well water, in order to avoid staining? I want to buy the appropriate test kits from you and would like to know what levels of each would pose a concern for staining. Almost any level, that you can measure, can be a problem, with well water. Certainly, 0.1 PPM would be a problem with iron and manganese. If you use a METALTRAP Filter, as the water is being added, you might spare yourself some of the problem. I always suggest use of a metal treatment, when well water is involved. A metals, minerals and contamination removing METALTRAP Dual-Cartridge Filter, with replaceable or reusable cartridges, will remove metals and sediments, before they get into the pool. I hope that this information will prove helpful. Good News! The ColorQ Biguanide PRO 5 Water Analyzer is an all-digital, hand-held tester that performs tests for biguanide, pH, total alkalinity, calcium hardness and biguanide shock. There are no colors to match and no look-up charts. It is an ideal tester for anyone with color matching difficulties. And it is affordably priced and easy to use. Seems to be just what you are looking for. I hope that this information will prove helpful. I have been using an OTO test for years. It almost seemed to be the only test, when we first got a pool. Today, I see more choices. Are they better than OTO? If so, why? Appreciate your advice. Thanks. OTO was probably the first test for chlorine and, in those days, there was a lot less known about the chemistry of chlorine in swimming pools. OTO measures Total Chlorine and that is not as important as Free Chlorine. The newer DPD Test Kits and various types of Test Strips usually test for both Free and Total Chlorine. This gives you a better picture of the sanitizer level and the water quality. OTO test kits have had their day in the Sun and their use is on the decline. The other kits are better, plain and simple. A ColorQ, all-digital tester would eliminate the color-matching and guesswork and would be an even better choice. I hope that I have been helpful. ► What's A TDS Test? My local pool dealer runs a TDS test every now and then. Exactly, what is a TDS test? Thanks. Total Dissolved Solids (TDS) is a measurement of the total concentration of dissolved materials in the water. It is expressed as PPM of sodium chloride (salt). Soft water has a low TDS. Hard water has a higher TDS. Salt water has a very high TDS. High TDS in swimming pools can lead to water quality problems. Most vinyl pools and pools, that are winterized, never encounter a TDS problem. In certain areas of the country, the source water is high in TDS and the pool water may benefit from monitoring. TDS is usually measured with a TDS meter and is relatively easy to perform. Many test meters, such as the one pictured to the right, also test for salt and other factors. Pools utilizing a salt chlorinator should use a meter that tests for salt and not just TDS. It is important to measure the salt content of the water, to assure optimum performance and longer cell life. I hope that I've explained the TDS test successfully. ► TDS And Salt Tests? The subject is TDS. My pool is a residential Fiberglass pool with a salt chlorinator system. I have read so many opposite points of view on TDS testing and on how to test that I am back to two basic questions. Do I even have to test for TDS as part of my routine tests? I have not had a TDS related problem in 3 years of pool ownership in my salt water pool? Some say a TDS problem is caused, 99% of the time by excessive CYA, so you treat the excessive stabilizer problem and ignore TDS. Others state, wait for TDS symptoms to appear and then test for TDS as part of the problem solving process. Others state a TDS problem in a salt water pool is so rare that there is no need to test for TDS. If I should test, what method do I use? Test for conductivity, test for TDS and subtract salt content, test for TDS and subtract initial salt content? Salt test reading is the TDS reading? Thanks for your help (previous and future). Not all TDS readings have the same implications. Years ago, a TDS over 1500 PPM was considered to be terrible. If you live in parts of Arizona, that passes for tap water. Your pool has about 3000 PPM of salt or whatever level the manufacturer of your salt chlorine generator re commends. Some use more salt - others less. Assuming it is 3000 PPM and you get a TDS reading of 4000 PPM. That means there are 1000 PPM of miscellaneous dissolved salts: some naturally present in the tap water and others added to control the pool water chemistry. The list includes bicarbonates, carbonates, sulfates and cyanurates, as the major salts and some lesser amounts of others. Unless you are having clarity or scaling issues, I would not be concerned about testing the TDS. If the cyanuric acid is over 100 PPM, you should replace water. There is no way it accounts for 99% of the difference between the TDS and salt readings. A normal pool has hundreds of PPM of calcium hardness and total alkalinity. Both test as TDS. If you use sodium bisulfate to lower the pH, the water will contain large amounts of sulfates. And this doesn't consider what occurs naturally. I suggest that you use a meter to test for salt. Some of the better testers do test for salt and TDS. Proper salt level is important. Too little and not enough chlorine will be produced. Too much could shorten the life of the salt cell. Tracer PockeTesters are the easy way to test the salt and TDS levels. I hope that I have shed some light on the subject. ► What Contributes To Rising TDS? Does sodium bicarb raise TDS levels with fresh water? I have gone from 320 TDS fresh water to 1300 TDS two months later. Thanks. Everything that dissolves in the water can contribute to the TDS: sodium bicarbonate, sodium carbonate, muriatic acid, sodium bisulfate, cyanuric acid, chlorine, shock, metal treatments, etc. It all gets measured as PPM of sodium chloride, in spite of being a varied mixture of salts. One pound of dissolved salts will raise the TDS by about 12 PPM, in 10,000 gallons of water. I hope that this has helped clear things up. ► When To Replace A Test Kit? How long can a pool test kit last? Should it be replaced every year? Thank you. It really depends upon the type of test kit and how and where it is stored between uses. Those generalized recommendations to replace the test kits every year are well-intentioned. Because so much depends upon the test readings and there is no simple, foolproof means for determining the accuracy of an older test kit, it is better to err on the side of caution and replace the test kit on a yearly basis. Some common sense must be applied. Test solutions, that do not look right, should be replaced regardless of their age! All test solutions should be resealed after each use and stored away from moisture, heat and light. Test strips usually have an expiration date. However, if you remove the test strips with dripping wet fingers, the moisture may destroy their reliability and/or shorten their shelf life. Make sure that you remove all test strips with dry fingers and that the container is resealed and stored away from moisture, heat and light. Most test strips are packaged in quantities that will last for about a season and, usually, need to be purchased season to season. If you would like a better type of pool water tester, consider the ColorQ Water Analyzers. These Colorimeter based testers are available in more than a dozen models and require no color-matching or guesswork. I hope that I have been helpful. Enjoy the pool season. ► Salt Testing vs. TDS Testing? Alan, excellent website! Learned more in a few minutes on your page than in several weeks of general web surfing. Couple questions for you. We have a chlorine generator and love it. I use salt test strips to keep tabs on the salt level. It doesn't change much over the course of the (short ) swimming season. But, when I re open the pool in the spring, I have to add back a lot of water and, of course, salt. I have been adding the salt and using the test strips. Today I took a water sample in for analysis at a local pool store. My salt reading with the strips was about 2800 PPM. The store did not use test strips, but simply equated TDS to salt level and told me my salt level was actually 3100 PPM. No real crisis here. But is TDS really an accurate read on the salt level? I suspect this really depends on what else is in the water. Comments? Second question. With all water parameters in balance I still seem to have to keep a close eye on pH and keep pulling it down on a weekly basis. It tends to drift up a lot. I have heard this is normal in a "salt water" pool. Why would chlorine from a generator have more effect on pH than chlorine pucks or other forms of pool chlorine? Are there pH reducers in the chlorine products that reduce the pH rise in "normal" chlorine pools? TDS measurements include the salt content plus naturally occurring minerals, carbonates and bicarbonates, calcium hardness minerals, chlorine stabilizer and other pool chemicals. These can easily add up to a few hundred PPM or more. A salt test reading is always the more meaningful measurement, as it is what the operation of the salt chlorinator depends on. Salt chlorinators tend to cause the pH to rise. The reason is that alkaline materials are released, as the salt is converted into chlorine. By comparison, trichlor tablets are acidic and tend to lower the pH. I hope that I have been helpful. Enjoy the season. ► Choosing A Salt Testing Meter? Have an above ground swimming pool with a salt water chlorinator. What salt water test METER should I consider and why? Salt content is important! Too little and not enough chlorine is produced. Too much and the life of the cell can be shortened. Your salt chlorine generator should be used with the recommended PPM, for that unit. There are two good choices LaMotte No. 1749 or LaMotte No. 1766. The latter tests for pH, as well, and costs a bit more. Either will serve your needs. I hope that I have been helpful. ► Action Based On Test Results? If your pool is gunite, which I suspect, draining is an option. I never suggest draining a vinyl pool. because of liner shrinkage and possible structural problems. The reason that water replacement was recommended was because of the high cyanuric acid level. Water replacement is the only means of lowering the level and 275 PPM is grossly high. Very high levels can interfere with the effectiveness of chlorine. While some of the other test values are high, I cannot be sure of their relationship to the source water. The stains could be the result of iron and other metals, even though the test results are negative. If you drain the pool, have the tap water tested for metals and add a dose or two of phosphate-free Liquid MetalTrap, in any event. If the tap water test is positive, you should use a MetalTrap Filter, to remove the metals, before they get into the pool. The yellow-brown material could be early mustard algae and it will benefit from a water replacement. If, by chance, the pool is vinyl, replace the pool one-two feet at a time. Evaluate you use of stabilized chlorine. If you are using trichlor tablets, do not use dichlor as a shock, inasmuch as it will speed up the rise in the cyanuric acid levels. I hope that the information proves helpful. ► The Color Is Orange? When I test my pool water for chlorine level the color I get, after applying the solution to it, is orange. It starts off a mild yellow but w/in 20 seconds turns orange. I had been running my chlorine at twice the normal dosage (5.0 vs. 2.5). Is this orange color because I went heavy on the dosage. Any help is appreciated. Thank you. The orange color indicates that the chlorine level is too high to read, with that tester. That type of tester is archaic and you should use one that tests for both free and total chlorine. The label dose is only a guide - you must add enough to maintain a proper level. 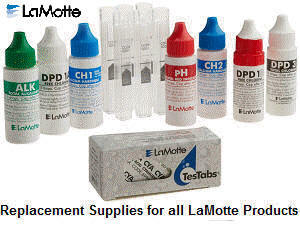 For free chlorine testing, I suggest using LaMotte Insta-Test strips, as they provide the right kind of information. To better assure proper overall pool water chemistry, visit a pool store that has a very reliable, professional lab such as a WaterLink SpinTouch Lab, rather than a less accurate test kit or strip reader. LaMotte Professional Testing Center Locator I suggest that you start by having the water tested for free and total chlorine. The total chlorine reading should not be more than 1 PPM higher than the free chlorine readings. If it is, add some non-chlorine shock. I hope that this information is helpful. On our test strip it states that the stabilizer is low. Our pH, CHLORINE and ALKALINITY all read fine. Please advise what might need to be done. The water is fresh- 1 week old. Thank you. Low levels of chlorine stabilizer will increase the loss of chlorine, due to the Sun's UV rays. You need to add some chlorine stabilizer (cyanuric acid). You did not provide the reading or how big your pool is. In a 10,000 gallon pool, one pound of cyanuric acid will raise the level about 12 PPM. That should help you figure out what needs to be added, based on the test lit recommendations. If you are using stabilized chlorine, this reading will rise over time. When it reaches 150 PPM, you should replace some of the water. Want to avoid future buildup problems? Have you ever considered a salt chlorine generator. No chlorine to buy, store or handle. No buildup of stabilizer! The LaMotte Insta-Test 6 does all of the important tests and would be a better choice, that the 3-test strip that you are using. I hope that this information is helpful. ► Can Type Of Lighting Affect Readings? I find the my pool water test readings, when taken at night, seem quite different. By then the lights are turned on. Is this possible? Thanks. Definitely could be the problem. Test strips and comparator colors can be influenced by lighting: sodium vapor lights are probably the most troublesome, by fluorescent or dim lighting can be a factor. It is best to read under bright natural light, without direct Sun exposure. One way to avoid all of these problems is with the LaMotte ColorQ Water Analyzers. There are several models and one would be right for your pool. I hope that this will help provide more consistency in the testing. There are compact and portable field manganese test kits that are suitable for your needs. Your customers will appreciate all the aggravation that you're are helping them avoid. If you know manganese is present before the pool is filled, you can use METALTRAP Filter to remove much of the manganese and iron. It should remove it all and can make a huge difference. Thereafter, it should be used to treat all new water, as it is being added. It simply attaches to the garden hose, being used to add the water. I hope that I have been helpful. One more word of advise. Add 1 dose of a quality mineral treatment product, such as Liquid METALTRAP, for each 0.5 PPM of manganese found. This should provide an excess to help deal with other minerals that might, also, be present. Have a good season. ► Using A Chlorine Neutralizer? I have 2 different pH test kits. One recommends neutralizing chlorine prior to measuring pH while the other does not. Obviously this results in very different pH readings. Which method should be used in order to guide pH manipulation. Thanks. It would have been helpful to know whether you have a pool or spa. Most phenol red solutions, but not necessarily all, have a chlorine neutralizer formulated into the product. This is important in order to help protect the phenol red from being "bleached out" by high levels of chlorine or bromine. Spas are more likely to be using bromine than are pools and the lack of a chlorine neutralizer can result in false high pH readings. You should be able to get comparable readings, with either kit, by following the directions. If there is an unreasonable difference, have the water tested by a pool or spa professional, in order to better determine the more accurate test kit. I hope that I have been helpful. Photometers, such as the ColorQ Digital Water Analyzers are capable of better reproducibility and accuracy than any test strip. A quality test strip, such as the LaMotte Insta-Test products, are able to provide test results that are reasonably and suitably accurate. The problem comes about in trying to match the colors to the color swatches. Using a strip reader does not impart greater accuracy and actually adds a few more variables. How long did you wait, before inserting the strip in the reader? How wet was the strip? Did water run, from one test pad to the another? What was the temperature? All of these variables, and more, affect the test results. An instrument, such as the ColorQ, is based on the same technology used in laboratory instruments and has a long history of successful use. Test strip readers may be convenient and fast, but are not capable of matching the performance of a quality photometer based tester. The feedback about the ColorQ line of testers has been highly favorable. The same cannot be said about dealer and consumer experience with test strip readers. I hope that this information will help you make the right choice. ► Questionable CYA Test Results? First of all, thank you for your recent advice. Like many others that have come to rely on you, I feel I have finally found someone who can give me a credible answer to my questions/problems. On 4 Feb I used a Stain remover to remove light brown stains in a portion of my fiberglass pool. I followed the process and it worked as advertised. However, I am concerned about some dramatic changes in the chemical balance of my Pool. On 31 Jan, in preparation of my stain removal process, I had my water tested by a local Pool Company. This test showed a CYA level @ 83 (OK for my area of the Country) and a TA reading of 114. On 11 Feb, 3 days after completion of the stain removal process, I had my water tested at the same Pool Company. This test showed my CYA level @ 35 and my TA level @ 152. My question: Is it normal for a stain removal process to cause such a dramatic change in CYA and TA? Unless you replaced more than 1/2 of the water, the cyanuric acid results are questionable. There is no way that it should drop from 83 to 35 PPM, without water replacement. One of the numbers is wrong and I suspect the latter. If that test result is wrong, the TA could be wro ng, as well. Some dealers use test strips, for testing, which are capable of providing a suitably accurate, but not precise test results. Using a computer to read the test strip, does not necessarily provide greater accuracy. This could be a case or dealer error or a bad water sample. I would encourage you to become more self-sufficient, as it will save you money and possibly help you avoid problems. The LaMotte ColorQ PRO 7 Water Analyzer performs 7 important pool steps, while eliminating color-matching, look up charts and guesswork. And it is affordably priced! I am not sure what was done, in the way of stain treatment, but the pH have increased and. that would account for the higher TA, as it moves in the same direction as the pH. To get a truer TA reading, subject 30% of the CYA reading, from the TA test result. pH and TA are interrelated. Adjust the pH to 7.2-7.6, as needed. If the TA is under 80-120 PPM, add some TA Increaser (baking soda). If the TA is 80-120 PPM, you're perfect. If the TA is higher, you may not have to do anything. There is no compelling reason to have to lower the TA, if the pH is in range and there is no sign of scaling or cloudy water. If the calcium hardness is over 400 PPM, you might keep the pH closer to 7.2-7.4. There's little point in trying to get both parameters in range, when circumstances and nature are conspiring against you. I hope that this information is helpful. ► Sampling - Testing Timeline? My technicians are often ask by the customer to bring a water sample to our retail store and have it tested. The h/o will than call in for the results. How long can a water sample taken from a pool sit before having it tested? Chlorine would be the most sensitive of the parameters. It will always be dropping and could be affected in a short time, depending on the quality of the water and the cleanliness of the container. Keeping the sample in a hot vehicle or in sunlight will only cause degradation to occur more quickly. Anything more than a few hours could be questionable. The other parameters are not as affected and little difference should be seen, in a tightly sealed container. Still, I suggest testing with a reasonably short time frame: 3-4 hours. I hope this information helps you set a reasonable guideline.